They are selling one of my favorites for audio fidelity, the CCRadio-SW, for $124.95 (reg. $149.95) and a limited stock of refurbished units for $79.95. They’re also selling their CCRadio-SWP, a small pocket radio with excellent MW and notable shortwave performance for $44.95 (reg. $49.95) with a limited stock of refurbished (“orphan”) units for $39.95. According to their promotional email, prices are good through November 26th at 12:00 PM. This entry was posted in Radios and tagged Black Friday Radios, C. Crane, CCRadio-SW, CCRadio-SWP on November 24, 2011 by Thomas. Where is the flashlights for 14.95, that George Norry mentioned was on sale for only black Friday. 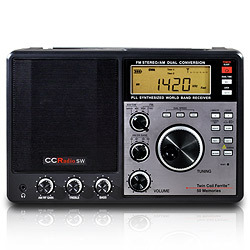 I have purchased three radios from C Crane and they did not last one year. I need a flashlight, and I thought I would give C Crane another chance.